Welcome to All India Momin Ansar Welfare Society (AIMAWS), we request to the world community to join hand with AIMAWS and extend all kind of possible help/support to the down trodden society of Ansar, Weavers etc., of our counrty, your help can become life for them. We must fight against poverty, and improve education, health, social impact amongst the society for world peace, and social unity and integrety of the Globe. -Mohd. Seraj Ansari -President-AIMAWS. 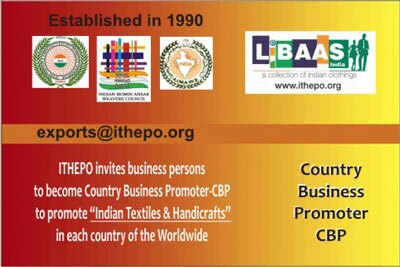 The ITHEPO - Indian Textiles & Handicrafts Exports Promotion Organization is looking Country Business Promoter - CBP in the following countries; Europe, America, Asia, Africa & UAE & Middle East Countries. The interested CBP must be very dynamic business personality and sound in his/her credentials and have very good reputation and networks in the country to find out the real buyers for ITHEPO of its products i.e. Indian Textiles & Handicrafts (the prospective clients would be like; chain of Stores, chain of Malls, chain of Supermarkets, Importers, Government Sectors and NGOs Agencies etc.) in their respective Country. The ITHEPO (ECP) ISE Cards India Limited will share profits on income as mentioned below to generate business for ITHEPO in his/her respective country. . ITHEPO is expecting monthly business in one country around US$ 200,000 to US$ 5 Millions or more. Interested parties can contact at : exports@ithepo.org . we would be happy to get company profile or personal profile to understand about expertise and experiences. Important : when interested party would be finalised by the ITHEPO management, after ITHEPO would issue a letter of authorization with party. Welcome to All India Momin Ansar Welfare Society (AIMAWS), we request to the world community to join hand with AIMAWS and extend all kind of possible help/support to the down trodden society of Ansar, Weavers etc., of our counrty, your help can become life for them. We must fight against poverty, and improve education, health, social impact amongst the society for world peace, and social unity and integrety of the Globe. -Prof.Dr. Mohammed Seraj ANSARI -President-AIMAWS. All India Momin Ansar Welfare Society.